Three interesting wine events are just around the corner for wine consumers residing in Singapore. For those who like to explore and discover what your palate prefers, or taste wines from a particular region and learn a little more, this would be a good opportunity. Those who are presently pursuing wine courses would find this a good time to taste and discover what their manuals and wine books speak of as well. Of course you can rope in a few friends and visit these events for the sole purpose of having a social get together. This main wine producing region in US has a lot to offer in terms of quality and variety. You'll get an opportunity to taste wines produced from different AVAs within California. 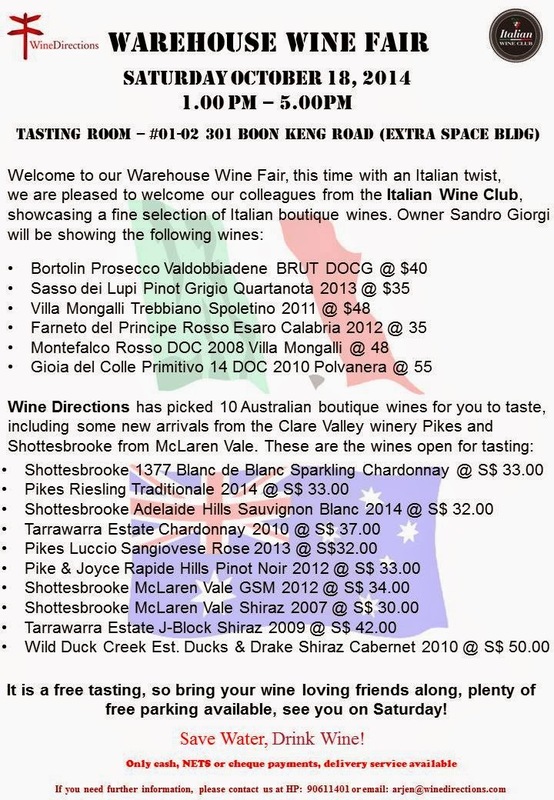 Wines brought in by various local wine merchants come together under the 'Wine Family platform' to showcase their liquid wares. One can expect wines from different countries, producers and vintages over here. I think it will be safe to say that this will be the biggest wine consumer event in terms of size for this year. The Straits Wine Company organizes this event. Wine consumers will by now be familiar with the concept as this event has been held in previous years. Just keep in mind that this time round there is a change in venue. It will be held at Clifford Square. Ms Stephanie Rigourd is a sommelier with Hilton Hotel (Singapore). I had the opportunity to attend one of her wine classes on food & wine pairing back in 2011. She is well knowledgeable on things wine, a good speaker who injects humour into her wine sessions, and I must say one of the few local sommeliers who have taken the time to organize and conduct wine lessons for the public on a regular basis over these past few years. In between her efforts at wine service and wine training, she travels quite a bit to wine regions to keep herself updated on the viticultural and vinification aspects of wine as well. I recently received an email on some of her upcoming wine classes. I'm posting the details here for those keen on such wine classes. For those who don't have time to attend professional wine courses which lead to some form of certification, these short wine classes offer an opportunity to gain some wine knowledge and meet like minded folks. Stephanie Rigourd (Sommelier, Hilton Singapore) at +65 6730 3216 or +65 8186 3745. Tasmanian Vineyards (Australia), with our guest wine maker Mr. Nav Singhi from Domaine Simah. Wine class about the growing wine region of Tasmania and the fabulous winery of Simah. Blind tasting of 6 wines - Aperitivo by the pool side- Cold Cuts, Canapés and Pizza from our Italian Chef Riccardo. New Topic! Secrets of the Wine making processes & How to differentiate between a wine which can age and a wine which can’t. In answers to your great feedback, this is a wine class to learn how to recognize an easy going wine from a complex wine. How do we know how long can we keep or age a wine, when is it ready to drink? Wine dinner at Il Cielo restaurant with our guest wine maker, Tim Lovett from Leeuwin Estate. 5 course dinner from our Italian Chef Riccardo, paired with 6 prestigious wines from Leeuwin Estate. We are proud to welcome back the wine maker Tim Lovett from the famous and well known winery Leeuwin Estate, Margaret River, Australia. 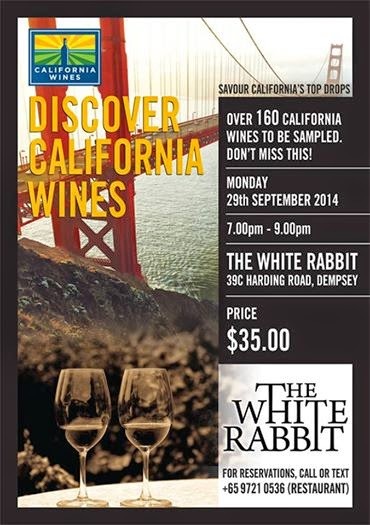 Wine class about – Margaret River wine region- Tim Lovett will share his experience and knowledge. Wine and Cheese Pairing with our partner “Cheese Artisans” How to match wine with cheeses? - Course of 30 min about the main rules of wine pairings - 6 types of cheeses per person - 6 wines to be tasted with the cheese. Aperitivo by the pool side, including some more cheese and wine. In answers to your great feedback, this is a wine class to learn how to recognize an easy going wine from a complex wine. How do we know how long can we keep or age a wine, when is it ready to drink? I contacted several Oenologists from Europe and Australia to help me to build a clear and interesting session. After the great success of this topic given for the first time on the 25th of September and a big demand from people who missed it, I am giving it for the second time. It’s the perfect session to begin with wine knowledge and to understand the basics of wine. This session will make easier to understand all the others. Spanish wines and the Rioja wine region. We are proud to welcome with our partner “Iconic Wines Singapore” the wine maker Matias, from the winery BODEGAS BERONIA in Rioja, Spain. Wine class about –Rioja wine region- Matias will share his experience and knowledge.